After Germany declared the coast of Angra Pequena (Portuguese for “small cove”) as its protectorate in April 1884, it then made claims on New Guinea, which was also claimed by Australia. As a result, tensions with Great Britain arose quickly. 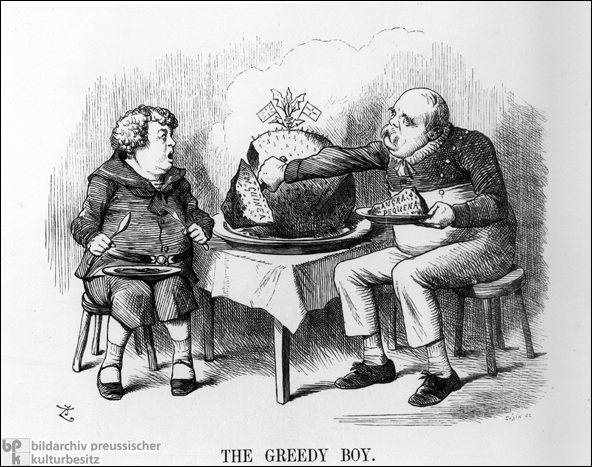 This cartoon, “The Greedy Boy,” was published in the English satirical magazine Punch (London) in early 1885. The corpulent John Bull, representing Britain, looks on as the “greedy boy” Bismarck cuts off a piece of New Guinea, even though he already has Angra Pequena on his plate.